As a company, Marvel Comics has gone by many monickers over the years, but none ever stuck out more in my mind than “The House of Ideas”. Many people argue that the 1990s attempts by Marvel to boost sales via Heroes Reborn and boost profits by self-distributing hurt the entire industry so much that they ruined their claim on good ideas, only offering BAD ones. But before all of Marvel’s big heroes teamed up to fight in the Secret Wars, and long before they worked together with their cosmic contemporaries to battle Thanos and his Infinity Gems, Marvel was proving itself worthy of that name on a regular basis. Every hero and villain had not yet met one another (and fought one another), and some teams were still in their growing pains or yet to be formed. Marvel Team-Up and Marvel Two-in-One were astounding readers by having two of the most popular heroes of the time, Spider-Man and The Thing, share adventures with everybody from Dominic Fortune and Frankenstein’s Monster to Iron Man and the Fantastic Four. The reason why these books were so popular was because the characters had never before shared the same page and fans got to see many first-time meetings, which often sprung from “misunderstandings”, leading to super-heroes duking it out! And if we readers liked it when super-heroes got into fights, then how could we resist a battle between the most popular MONSTERS of the Marvel Universe? 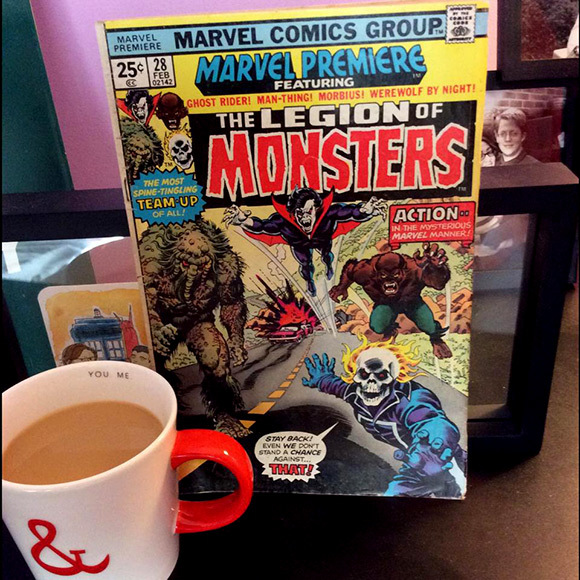 And so was born, as the cover boasts, “The Most Spine-Tingling Team-Up of All”, The Legion of Monsters! It’s a fine evening in Los Angeles, California, not unlike any number of pleasant evenings where people take to the streets to ride with the wind blowing their hair. This is no ordinary evening, however, as a mysterious mountain rises up from the ground (or perhaps falls from the sky?) right onto Sunset Boulevard! Johnny Blaze happens to be in town and decides to abandon his plan to see a movie and instead investigate this strange phenomenon. Blaze gained supernatural powers as a former minion of Satan, but now free of that burden he rides the streets as the demonic-looking Ghost Rider! At the same time, two figures atop the Los Angeles rooftops come together in a most unpleasant way. Morbius, the Living Vampire (who cured his own deadly disease by turning himself into a bloodthirsty vampire) swoops down upon his intended victim, only to find that that victim is none other than Werewolf by Night! (known as Jack Russell during daylight hours). Fangs and claws are bared and slashed against one another until they are both rocked off of their feet by the tremors which signal the strange mountain’s arrival. Momentarily forgetting his bloodlust, Morbius makes his way up the mountain and Werewolf by Night follows. Meanwhile, in the swamps of the Florida Everglades, Man-Thing (we covered his origins last column), wanders aimlessly through the muck. When he turns, however, he faces a mountain that had not been there a moment before, and so he begins to “climb up the hills of a memory” (which somehow transports him from Florida to Hollywood). As they approach the mountain’s apex, the vampire and werewolf find Johnny Blaze’s motorcycle, and as Morbius investigates, he is stunned to see Man-Thing approach from the mountain’s brush. Ghost Rider silently made his appearance, too, because we see all four of them together as a new entrant arrives to everybody’s amazement. Before this Legion of Monsters appears a pair of figures with large proportions: a golden man waving to the monsters who is riding a glimmering golden horse! The stranger bids them welcome, saying “I am he who is called the Starseed!”, and proceeds to tell the story of how his people broke off from the warring tribes of early man to build a peaceful city up in this mountain. One day, an alien starship arrived, killed their leaders and absconded them to the stars by yanking the entire mountain away from the Earth with some powerful pincers extended from their flying saucer. The golden people eventually wrested control from the aliens and “flew” their mountain home through space to return to Earth. Starseed is the last of his people and now wishes to rejoin the home planet he left so many eons ago. Ghost Rider has a slight issue, however, with Starseed parking his mountain right on top of Los Angeles. Morbius begins to chime in his own objections when Werewolf by Night launches himself at Starseed’s neck (because since when does a werewolf need a good reason for necking?) and pulls the stranger off of his golden steed. If that isn’t enough, Morbius’ bloodlust kicks into overdrive and “cries out for the blood of the golden one!”. Ghost Rider believes that Starseed doesn’t mean anybody harm in his arrival, and so decides to save him from the two monstrous maniacs. That is, until he spots Man-Thing creeping up from behind, a creature he’s ever seen before and which has no means of communication other than reaching out with his slimy, grotesque arms! Ghost Rider blasts Man-Thing with his supernatural hellfire, although it does no good, and then leaps onto his motorcycle to get away. Having not forgotten Starseed’s plight, Ghost Rider lures Morbius away with a blast of hellfire, searing the living vampire with flames. Morbius decides to sample the blood in the Rider’s veins and flies after him while Werewolf by Night continues to struggle with Starseed, who can only scream “Why, brother? Are you mad? Why are you doing this?”. The ferocity of the savage assault is far more than Starseed can handle, despite his physical gifts and larger size. A slash to his throat brings great pain to Starseed, and even though he manages to hurl Werewolf by Night away, the pain has brought him fear, and the fear attracts Man-Thing. What happens next is not for the faint of heart as Man-Thing grabs hold of the man from the stars and a blood-curdling scream exits his lips, for whoever knows fear BURNS at the Man-Thing’s touch! Ghost Rider charges the Man-Thing with his Hellcycle, knocking the creature back and away from Starseed. Werewolf by Night stalks his golden prey, as well, and so must be dealt with by a blast of Ghost Rider’s hellfire. Barely keeping the them at bay, Ghost Rider senses that the stranger still moves. Starseed raises his hand and gives all four creatures a glimpse of his power: Man-Thing transforms back to his human self, Ted Sallis; Jack Russell appears, free of his lycanthropic curse; the vampire turns human again, into Michael Morbius, graduate student and scientist; and Johnny Blaze no longer feels the Ghost Rider inside of him. Sadly, the power of Starseed cannot make these changes permanent, because his life force is fading away. As the other three wander off to face their cursed lives, Johnny Blaze mourns the passing of Starseed and the loss of an opportunity for the others to regain their humanity. This is one of the stranger stories I’ve read in a while. The only real “hero” in this story is Ghost Rider, whereas Man-Thing is a plot device and the other two are monsters looking to kill somebody. This doesn’t exactly give you many people to root for, but that’s what makes for interesting horror and fantasy. No part of Starseed’s story makes any sense and we never learn how his people survived in airless space or how he became a golden, immortal giant. Starseed had never appeared in a Marvel Comic before this issue, and has never again been seen since. For that part, we never find out what happens to his golden steed, either. Morbius and Werewolf by Night both demonstrate savage ferocity in this story and we get a faint notion of the Man-Thing’s predicament, existing mindlessly and dependent on other people’s emotions. I believe the cover was designed before the script was finalized since it doesn’t show Starseed and has Ghost Rider warning his “teammates” to “Stay back! Even WE don’t stand a chance against… THAT!” (of course, “that” would turn out to be anybody’s guess). Overall, this story has a different tone to it than most of Mantlo’s other works – not bad, merely different – but Frank Robbins and Steve Gan’s artwork is lazy and uninspired. Mantlo finds a way to narrate in the second person for Man-Thing, Morbius and Ghost Rider, but strangely never Werewolf by Night. Despite it’s pedestrian illustrations, the story is creative and memorable, and certainly uses the opportunity to show why Marvel held the title as the House of Ideas during the Bronze Age of Comics. Fare Thee Well! Marvel Premiere #28 is written by Bill Mantlo, penciled by Frank Robbins, inked by Steve Gan, lettered by Karen Mantlo, colored by Janice Cohen and edited by Marv Wolfman, with a cover by Nick Cardy and Irv Watanabe (1976).